1.Make There Be Any Charecter You Want In it. 3.Make What They Say When You Put Your Mouse On The Button. 4.If Its About The Deletheads You Can Do It. Downloads= If You Don't Have Any Money, You Can't Get Any Downloads! Store= What? This Is A Strore! Email This Compy Can Only Check Email! Sounds like fun. Worth a shot, anyway. Setting: The Smoky Office, set up as it was in Dangeresque Roomisode 1, where there is a blue phone instead of a typewriter, and a safe can be seen beside the window. The window's blinds are closed. Homestar in this menu acts in his role as Dangeresque, Too, and so reads all of the menu options in a gritty, no-nonsense action hero voice. TOONS: The first time, Renaldo walks in, throws the newspaper seen in Dangeresque 1 and 2 on the table, and says, "We gotta get the serum!" He walks out, but the newspaper stays. The second time, Renaldo throws a second paper on top, and says, "We gotta get the tape!" The third time, Renaldo throws says, "We gotta get the formula! ...And your Dad, and the kidnapping victim, and the mysterious paperweight, and Cutesy Buttons, and some ruby, too! ", and throws another newspaper for each item before leaving. The fourth time, Perducci runs in, takes the papers, and runs out, cackling evilly. Then, the cycle repeats. GAMES: The office turns into its pixellated counterpart from Dangeresque Roomisode 1, and 8-bit Dangeresque from the same comes in and bangs on the desk. He leaves, and the world changes back to normal. DOWNLOADS: The vault door swings open and dollar bills begin to fly out as long as you keep your cursor over the word. 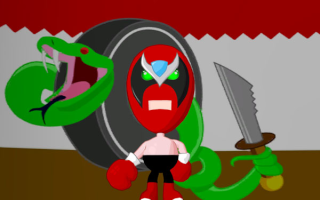 STORE: The blinds open to show the shadow of Killingyouguy as Strong Bad, imitating a guitar, sings a dramatic tune, identical to Killingyouguy's introduction from Dangeresque 1: Dangeresque, Too? E-MAIL: After Dangeresque, Too says the line, Dangeresque jumps in, landing on the desk, shouting "Die, Uzi-Bazooka!" He shoots Uzi-Bazooka, who falls below the edge of the screen, and then the real Dangeresque, Too walks in. He says, "Thanks, partner!" and takes Uzi's place as Dangeresque leaves.